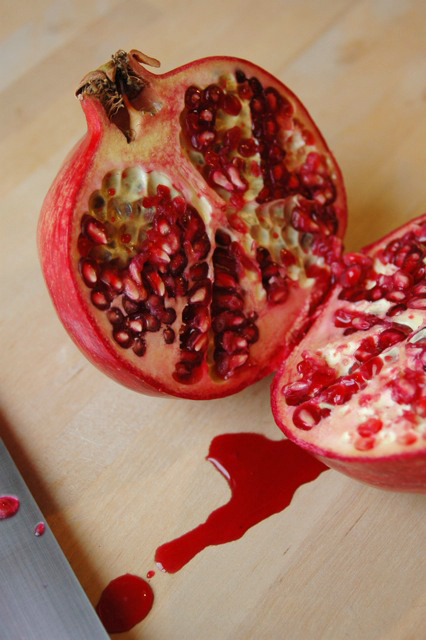 FOODIE.CH -- Issue No.3-- What Can You Make With...POMEGRANATE? What Can You Make With... POMEGRANATE? 25ml freshly squeezed orange juice. Pour champagne into flute. Then add juices and serve. OPTIONAL: pomegranate seeds into the glass as deco. Ricotta cheesecake has a different texture than your regular cheesecake that is lighter yet still has great flavour while showcasing ricotta cheese. The sweet crunch of pomegranate seeds adds a special flare to the caramel sauce that makes this dessert stand out from others. In large bowl, using electric mixer beat ricotta and Mascarpone cheeses with icing and granulated sugars until combined and smooth. Beat in pomegranate juice and orange rind. Beat in eggs, one at a time, beating well after each addition. Wrap outside of a 9-inch (23 cm) springform pan with foil. Pour cheese mixture into prepared pan and bake in 375 F (190 C) oven for about 1 hour or until top is golden and centre is still slightly jiggly. Turn oven off and let stand in oven for 30 minutes. Remove from oven and let cool to room temperature. Refrigerate for at least 4 hours before serving. Caramel Pomegranate Sauce: In saucepan, combine cream, sugar and butter over medium heat until smooth. Bring to a boil and boil for 2 minutes, stirring. Remove from heat and stir in pomegranate seeds. Let cool to room temperature. Serve with cheesecake. Tip: Cover and store in refrigerator for up to 2 days (cheesecake and sauce). Warm sauce before serving over low heat, stirring occasionally. Degustation notes: Viridescent yellow color. Fruity bouquet with a subtle note of Chardonnay. Lean on the palate, fruity, with a fine nerve.